One of my personal favorites. 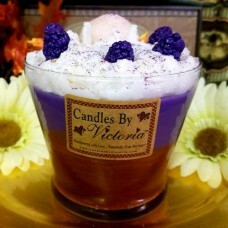 This amazing candle begins with a layer of our Bear Claws fragrance, we then pour a second layer of Blackberry followed by a whipped topping of Berry Blackberry Cobbler. We then top the whole thing with blackberry wax embeds, a scoop of wax ice cream and finally we sprinkle with a touch of glitter. A favorite among many, this is one candle you will have to force yourself not to eat!